MPEG means Moving Picture Expects Group which is a term of a group of principles adopted for coding audio-visual info, for instance, video, films, songs, etc. in a format of digital compression. The primary feature of mpeg formatted contrasted to other formats of video or audio is that mpeg file has smaller size with same quality. That’s because mpeg files are created with much more complicated compression technology. When you run into files saved with extensions in .mpg or .mpeg, they are usually in the format of mpeg-1 or mpeg-2. Mpeg-1 files are mainly utilized on VCDs and CDs, while mpeg-2 files are chiefly used on DVDs and SVCDs. Mpeg files are ubiquitous on computer hard drive, for many videos files are saved in this format. So it’ll be heart-breaking if we lose mpeg files which might be previous video clips or movies you’ve gathered for years. First we should make out why mpeg files get lost and then we can find ways to restore them easily. 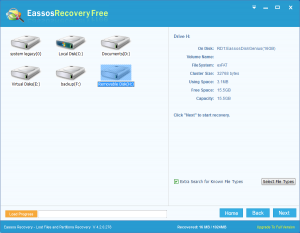 How to recover lost mpeg files from hard drive or removable drives? Once mpeg files get lost and you failed to find them from Recycle Bin, you need to go for mpeg file recovery software. There is free file recovery software online which can recover lost mpeg files with high-efficiency and easy operations. 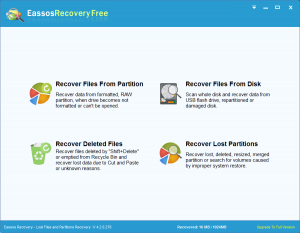 Step 1: Install Eassos Recovery on your computer. Do not install it to the partition that loses mpeg files. After installation, the software will be launched automatically, then you can choose recovery mode. Step 2: Select the partition or drive in question and click “Next” to scan it. Step 3: Select wanted mpeg files and save them to a safe location. Do not save files to the path where you lost them. This entry was posted in Data Recovery and tagged free file recovery software, MPEG file recovery, recover mpeg files by EASSOS. Bookmark the permalink.